After our overnight hike along the Black Ridge Loop in the Colorado National Monument last year Diane had mentioned to me that she enjoyed the hike up the Fruita Dugway and wanted to hike it again, so this year I planned a different loop that included the Fruita Dugway, Black Ridge Trail, CCC Trail and then returned down Monument Canyon. It would make a nice 13.5 mile loop on the western side of the Monument. 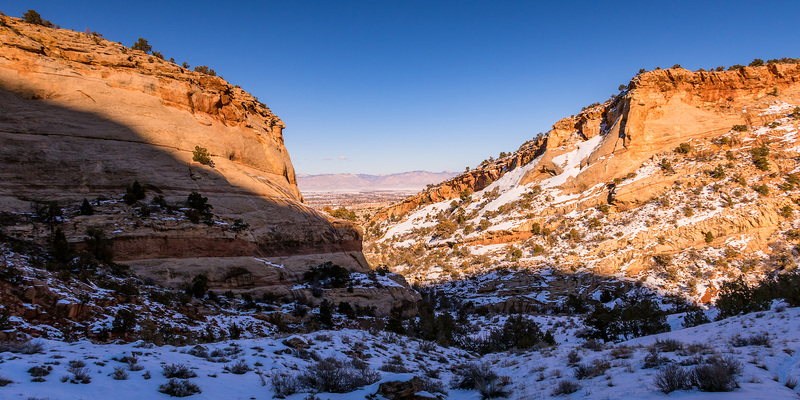 We dropped my Jeep off at the Lower Monument Canyon Trailhead shortly before sunrise and then drove over to the Fruita Dugway Trailhead and started climbing the trail as the sun was coming up for the day. The Fruita Dugway is probably one of my favorite and often overlooked trails in the Colorado National Monument. We were originally planning to drive down to Ouray this morning for the annual Ice Festival, but Diane wasn’t feeling very well when we got up so we stayed home. Instead, I headed out this afternoon to get a little local hiking in at the McInnis Canyons National Conservation Area trails near Fruita. I have hiked a few of the “K” trails near the mouth of Kodels Canyon in the past but had not been on all of them, so I decided to try and check out the rest. I started from the Kodels Canyon Trailhead along the highway and ended up hiking all of the remaining “K” trails that I had not been on before. The length of the hike ended up being just under 5.5 miles. The temperature outside was a little bit above freezing and I was glad that most of the trails were still covered with a layer of packed snow or I probably would have had to deal with hiking in the mud. Much of the day was overcast and a little gloomy but the sun did show up for a little while and brought a little blue sky, too. I didn’t take many photos on this hike because of the overcast conditions, but I did take a few snapshots along the way when the sun was out. 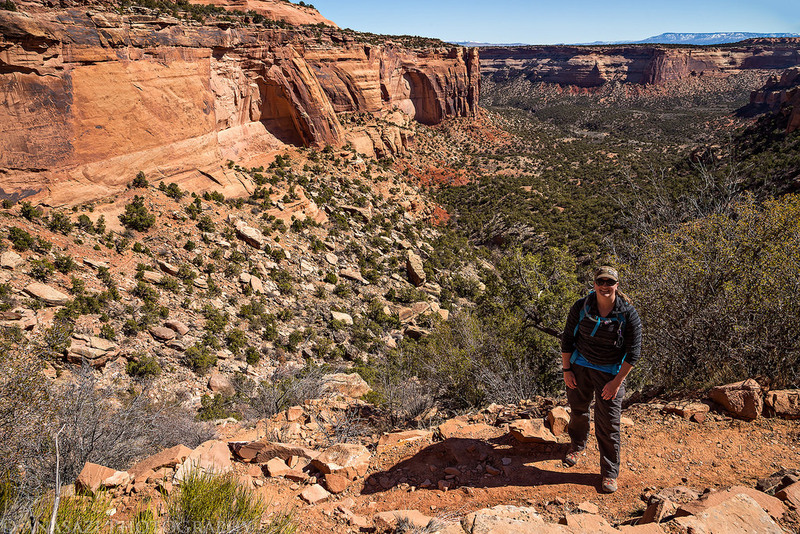 After completing a traverse across the face of the Colorado National Monument last year I decided that I wanted to put together a longer loop through the Monument to hike this year. 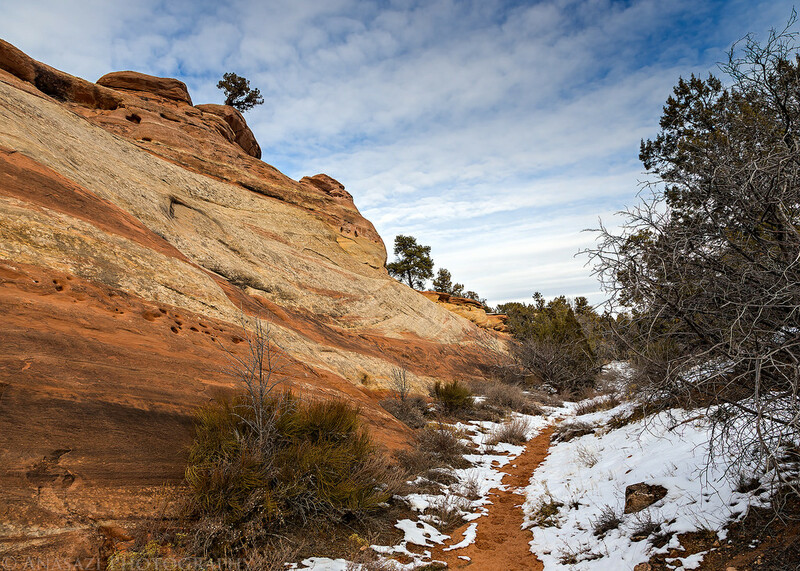 The route I strung together begins at the Kodels Canyon trailhead outside of the Monument near Fruita and climbs up the historic Fruita Dugway trail where it connects with the Black Ridge Trail. 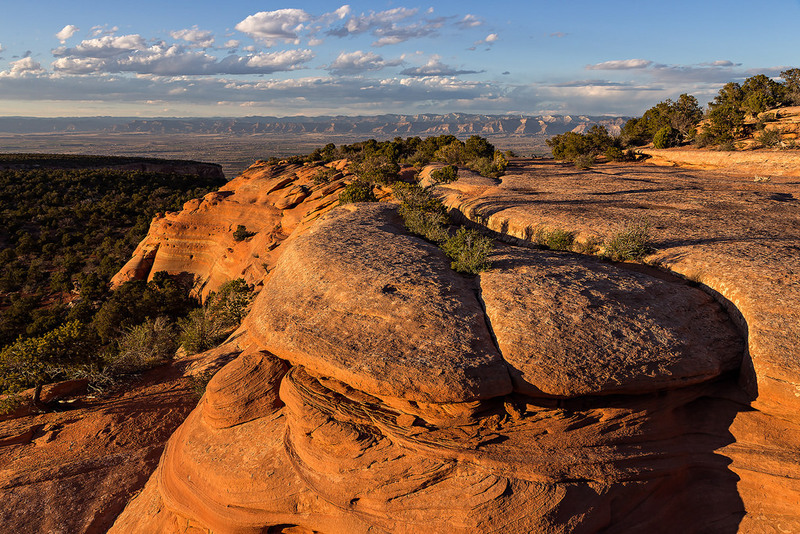 The Black Ridge trail is the highest trail in the Colorado National Monument topping out at just over 6,700 feet. Since the trailhead is at about 4,700 feet, this route ascends over 2,000 feet of elevation gain while climbing from the lower part of the Monument to the higher part. After following the Black Ridge Trail to it’s end at the Upper Liberty Cap trailhead we would then follow the entire Liberty Cap trail back down to the Wildwood trailhead. Since this route is about 18 miles in length, I thought it would make a nice overnight backpacking trip so that we could take our time and spend a night in the Monument. I stopped by the Visitor’s Center on Friday and picked up a backcountry camping permit so that we could start the hike bright and early on Saturday morning.